Sorry to hear Victor, very kind of you to do this. Very cool poster, Happy Holidays, and here's to another year wiser..
Wow. That's an impressive line-up. There's a lot of stuff up there that I'd give up a limb to have. I'm going to put in my bidding and I'll spread this around to my non animation geek friends. Holy cow, this painting is awesome Victor. Great piece and great cause. I visited the booth at the CTN-X in Burbank. So uplifting and inspiring when people come together and help each other. Hope you enjoyed the holidays and got a good start on the new decade. 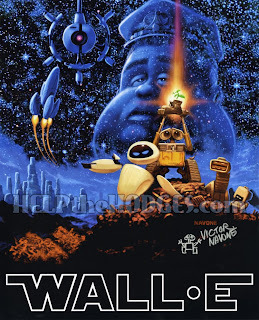 Hi Victor - actor Fred Willard just signed your Wall-E print yesterday as well! It will be posted on eBay on February 4! Our auctions started on January 21.